If you have £1,000’s on credit cards and store cards, have a bad credit score and are worried how you will ever pay off your debt, then we could have the solution with our range of long terms loans for bad credit. You could consolidate all your existing credit into just one loan with one affordable monthly repayment that fits your budget. This could help you to manage your credit repayments much more easily. Unfortunately there is no ‘quick fix’ solution to repaying the credit debt that you owe and long term loans for bad credit could be the best option. With the consolidation loan now in place, looking after your outgoings, you can start to enjoy life again with peace of mind knowing exactly what your monthly repayments will be, and the date by which your loan will be repaid in full. If you are also looking to raise additional finance, you could borrow extra, all within that one monthly repayment. 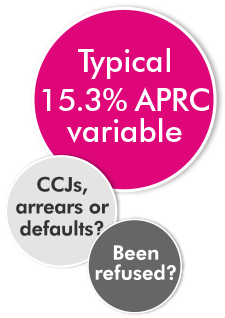 You can estiimate your repayments using our loan calculator below. Apply now, one of our team will call you straight back and we could give you a decision on your loan within the hour.